New Balance is one of the world’s largest athletic shoe manufacturers. The company aims to bypass conventional industry practices and provides state-of-the-art products to professional athletes and everyday consumers. One of New Balance’s latest innovations is the addition of an additive manufacturing laboratory; boasting the production of the world’s first laser-printed shoe. The ‘Zante Generate’ is the world’s first running shoe with a 3D-printed midsole. Composed of Duraform® TPU Elastomer, the revolutionary sneaker is made using a laser sintering process. A dual-purpose laboratory used for new product development and research, the 3D printing facility processes a variety of additive polymers. Initially, New Balance’s laboratory began by processing small-batch work. However, looking to up-scale to larger levels of production, New Balance turned to Russell Finex for a solution. A Russell Compact Sieve® with Vibrasonic® Deblinding System was the answer. This combination not only fulfils the need to increase throughput, but also ensures the purity of processed powders. Now an integral part of New Balance’s 3D additive manufacturing lab, the Russell Compact Sieve® with Vibrasonic® Deblinding System is relied upon every day. For New Balance, using this vibratory sieve is critical to aerate powders before the material is loaded to a laser sintering machine. Aerating powder increases the flowability of the material, which is required for stable processing of prints running over 24 hours in duration. 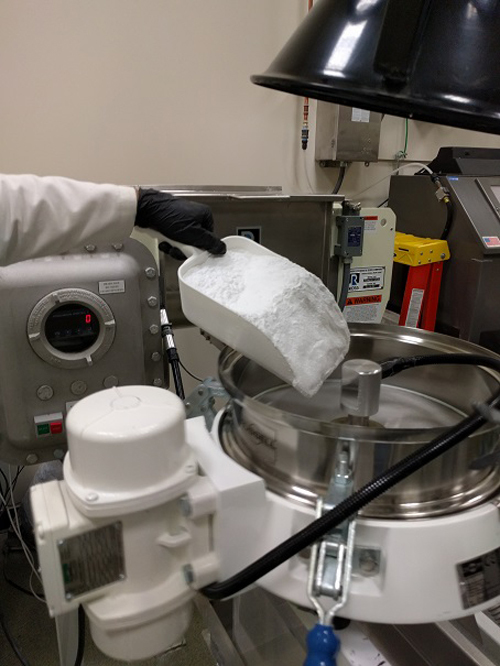 Aside from increasing flowability, this screener with ultrasonic screening technology has also been credited for freeing time for the additive manufacturing lab’s engineering team as it screens powders much faster than traditional all-day monitored sieves. The addition of the Russell Finex sieving machine for additive manufacturing has also allowed New Balance to experiment with powder and complete custom batch work in a much quicker fashion. Established in 1934, Russell Finex has over 80 years of experience in working with manufacturing powders. The company, having worked within the 3D printing industry since its beginnings, has built relationships with key equipment manufacturers and end-users, to ensure its separation equipment meets the current and future needs of 3D printing technology. Contact Russell Finex to found out more.